WILDFIRES: OR MAYBE WE'RE JUST "FICKLE!" This was a stressful and frustrating day for both of us. Positive thoughts won't make the rain go away!! With another week of chilly temperatures, heavy rain, and fog predicted for Denali National Park and Fairbanks, we decided to leave the park this morning so we could camp somewhere with electricity. The camper stays more comfortable inside when we're able to use our little electric heaters and a dehumidifier instead of a propane space heater. If it stayed more like this, we'd be at Denali NP longer! In addition, last night we couldn't get a phone signal or get on the internet with our MiFi. It was worse this morning; even the park Mercantile's computers and phones were down. That did it. We're outa here! We checked out at the campground office and Jim dumped black and gray water before leaving the park. It took less than two hours to get to our next campground. 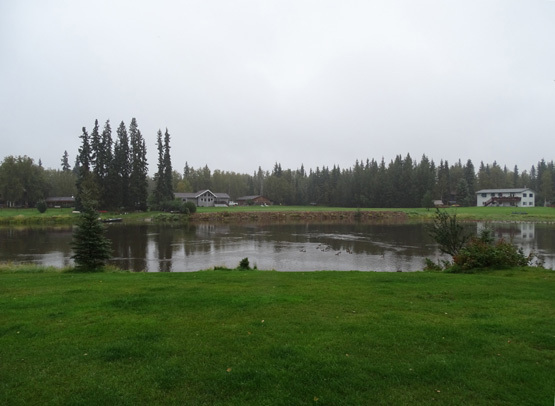 The drive to Fairbanks was rainy, foggy, and chilly (40s-50s F.), with minimal traffic on the Parks Highway. It was so dreary and the views were so limited I didn't even take any photos along the way. That's a first, and an indication of how bummed out I was about the weather. The road was pretty smooth to Fairbanks. 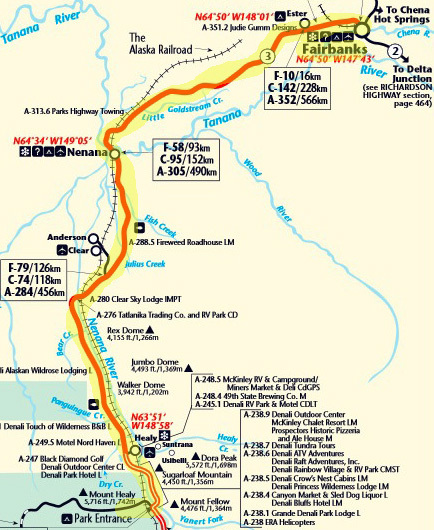 There is still road work right at the entrance to Denali National Park. 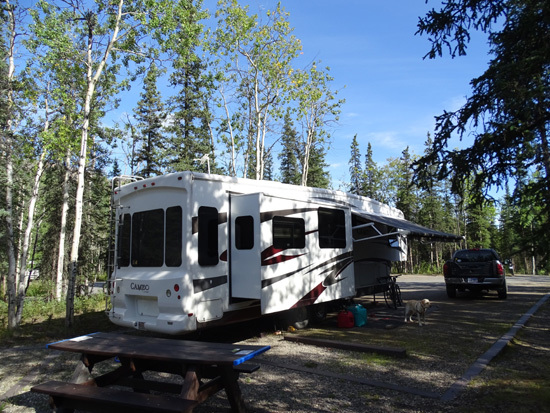 We decided to camp at least one night at River's Edge RV Park. We originally had a reservation there for Aug. 30-Sept. 7 but cancelled it a couple weeks ago. There are a lot of empty sites tonight so we didn't have a problem just showing up and asking for a 30-amp pull-through FHU site. It's a whopping $42+/night with military or Good Sam discount but we do have free WiFi (700 megabytes each) and cable TV. Since it's all wet here, too, for the next several days we plan to leave in the morning and head back toward Canada. This afternoon we stocked up at Sam's Club and WalMart and got gas for the generator, diesel for the truck ($3.36/gallon), and propane for the Cameo ($3.29/gallon). We'll be glad when we can get cheaper fuel in the Lower 48. When I was looking at produce at WalMart I realized we already had a LOT of fresh fruits and vegetables, as well as chicken and eggs. Any of them may be a problem at the Canadian border. I loaded up on groceries in Anchorage, anticipating seven days at Denali instead of two -- and more than just one night in Fairbanks. There is an avian flu scare from fresh poultry and poultry products so I thawed out eight chicken breasts and cooked them this evening. We hard-cooked all eight eggs, too. From what we've read on the Canadian customs website these items shouldn't be confiscated if they are already cooked. We ate some fruit and veggies and will have another day tomorrow to continue eating those. I dug out the passports, the dogs' papers, and other items we might need in the truck with us when we go through the Canadian border. We hope we don't have any problems on Thursday when we head into the Yukon. 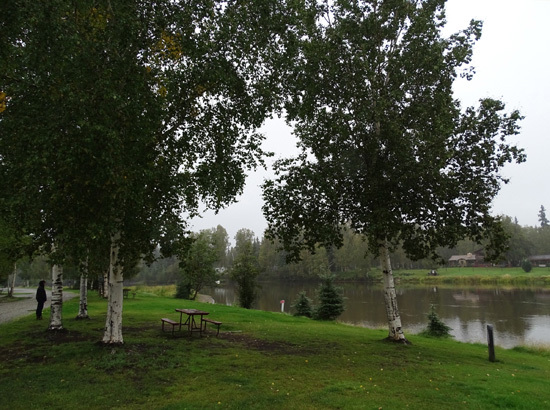 River's Edge is probably a very nice RV park but with all the rain, it's hard to tell. 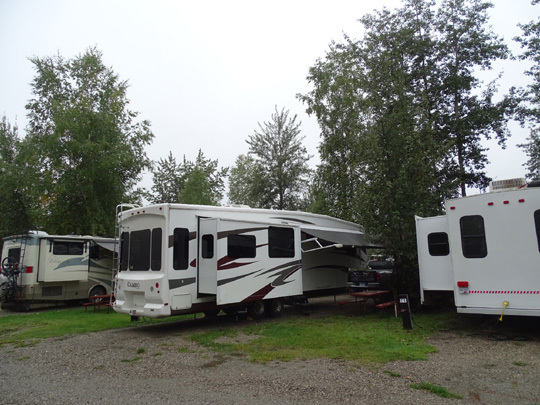 The sites have more room than some we've found in Alaska, even at higher-priced RV parks. Our site has enough room but nothing like the prime site we just had at Denali. I hated to give that up after only two nights but I'm OK with leaving. 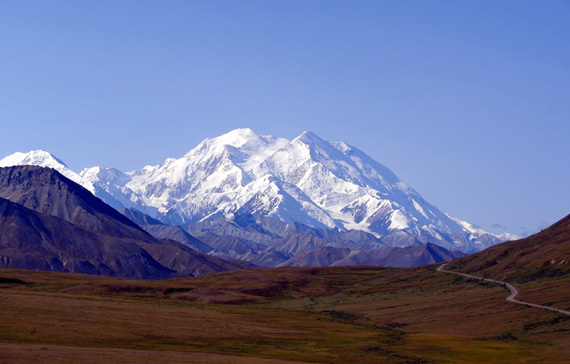 Denali National Park, the state of Alaska, and NW Canada are fabulous when it's sunny. When it rains for days on end, snow is predicted, it's cold, and there is smoke from wildfires . . . it's time for us to head south. Hopefully the rain will literally put a damper on the wildfires. You can call us "fickle" like my sister does, or you can just say we like to be comfortable and safe.